Keenan Household the last two months! Playtex Lil' Gripper Straw Cup: This is the perfect cup for in the car or on the go! It's easy for Liam to hold, and easy for me to clean! It's leak proof, so I don't worry about water getting every where when I give it to Liam while he's in his car seat. We're still avoiding all sippy cups with a spout, but the straw cups I'm totally okay with. Boon Bath Appliques: Liam is obsessed with these! In fact, he carries them all over the house and will even bring them outside. At any given time, there is a good chance that little L will be have one of these in his hands. While in the tub, Liam loves sticking them to the sides or trying to hold them all in his hands at once! They have also proven to be a great teething toy and have survived the many teeth marks they are now covered with. Swimways Baby Float: This is perfect for a day at the pool or the lake! The sun canopy is a wonderful little feature, so you don't have to worry about always having a hat on your baby (who is probably always trying to rip it off their head anyways). It also comes off easily in case you don't want to deal with it. Added bonus, this floaty folds up nicely which makes traveling with it a breeze! 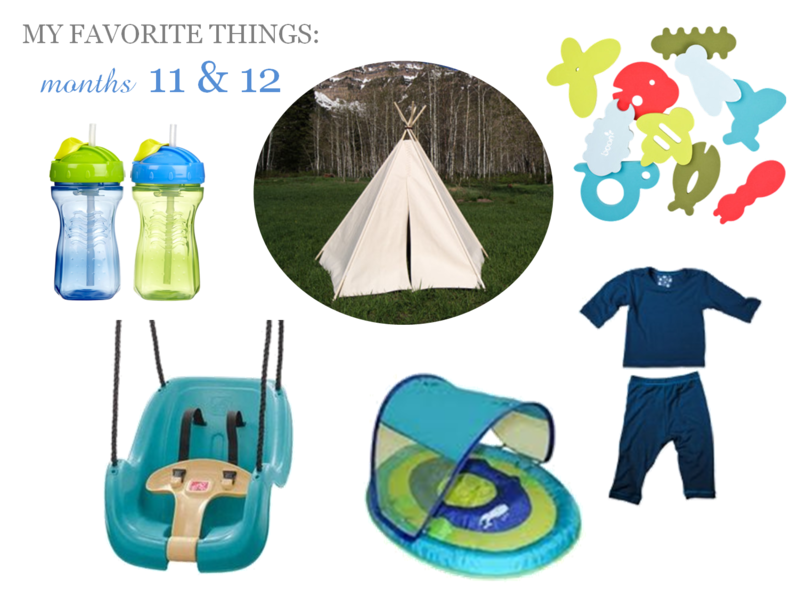 Teepee: We absolutely love this teepee! It's the perfect size: big enough (barely) for Conor or I to play inside with Liam, but small enough that it fits in most spaces and is easy to put away (not that we'll ever not be using it)! Liam loves running in & out of it and reading books inside. Sometimes he just likes to walk the perimeter while I grab at his toes from the inside. Endless fun! The owner of this etsy shop, Megan, was great to work with; I can't recommend her enough! Kickee Pants Pajamas: These pajamas are pretty pricey, but they are oh so soft! They are definitely a splurge item, but well worth it. The jammies are made from bamboo which makes them super light and cozy. We only have one pair, but I wish his entire pajamas collection was made up of Kickee Pants! As soon as they are clean, he's back in them! Step 2 Swing: Little L loves to swing! My parents bought this one for their lake cabin, and we just purchased it for our house! I like how the colors are more neutral than some other swings on the market. It's great quality, so I know it will last through all of our kids! We have the Swimways Baby Float and love it! I totally want a teepee for my son's room! I'm afraid of how quick he would dismantle it in the middle of The night though. Liam doesn't have access to the teepee at night, so I don't worry about it. But he's pretty rough with it when we play in there and so far it has stayed intact and hasn't crashed down on him yet!